Charlie Rivel (born Josep Andreu Lasserre, 1896-1983) is one of the few clowns ever to have achieved true international stardom. Like Grock and the Fratellinis before him, Rivel was beloved all over Europe, feted by royalty and popular audiences alike. He inspired paintings and novels, movies and plays; his image was used for dolls and other souvenir items; and he received every honor and accolade open to a performer. Spanning eighty-two years, Rivel's career took him from rags to riches. Deftly blending superb artistic skills, a talent for pantomimeA circus play, not necessarily mute, with a dramatic story-line (a regular feature in 18th and 19th century circus performances)., and a flair for public relations, he developed a totally original clown character that stands today as one of the twentieth century's greatest circus icons. Rivel's father, Pedro Jaime Andreu Pausas (d. 1957), was the son of a cabinetmaker from Barcelona, Spain. In the 1880s, when he was fifteen years old, Pedro and his brother Juan left home to follow Circo Milá. As members of the circus, the brothers began performing a trapeze act. Pedro later joined another circus, Circo Alegría, where he met—and later married—a French acrobat, Marie-Louise Lasserre Seguino. Spain had fallen on hard times, and in order to survive, the young family decided to cross into France, where they hoped to find work. As they made their way toward the border, they performed in village squares across Catalonia. They were traveling in a hand-drawn wagon when Marie-Louise gave birth to José (the future Charlie) in Cubelles, a village near Barcelona. Surviving as best they could, they finally reached France three months later. They soon secured an engagement with the small Cirque Dusoulier. This was the first circus ring little José stepped into. At age two, he appeared in his father's risley act. The following year, the family was with Cirque Caignac, where José performed both a solo parody of a strong-man act and a hand-to-handAn acrobatic act in which one or more acrobats do hand-balancing in the hands of an under-stander. 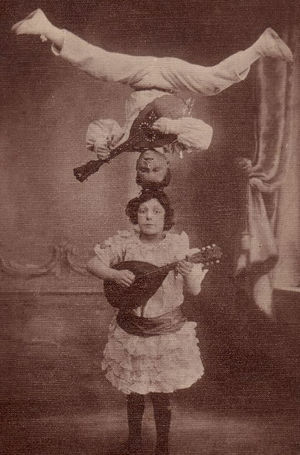 balancing act with his young sister, Neña (Marie-Louise Andreu, 1897-1915), in which he originally dressed as a girl—which made their "all-girl" act look more attractive to agents and directors. The Cirque Caignac was destroyed by a storm in 1904, and the Andreu family again fell to performing in village squares—José doing acrobatic dancing, perch-poleLong perch held vertically on a performer's shoulder or forehead, on the top of which an acrobat executes various balancing figures. balancing, and a hand-balancing act—before joining the Cirque Caron in Grenoble. There, José learned trickAny specific exercise in a circus act. riding and began to play the guitar, violin, and mandolin. The Andreu family went on to other small circuses, where José appeared in a balancing trio called Los Pepitos with his sister Neña and his brother Polo (Paul, 1899-1977). It was probably in 1905, at the circuses Zanfretta and Lambert, that the three siblings began work on their standing-frame flying-trapeze act, with Neña as the catcherIn an acrobatic or a flying act, the person whose role is to catch acrobats that have been propelled in the air.. The following year, in 1906, José got a first taste of clowning, when the director, Monsieur Lambert, called on Jose to replace the house clownGeneric term for all clowns and augustes. '''Specific:''' In Europe, the elegant, whiteface character who plays the role of the straight man to the Auguste in a clown team., Carleto. Meanwhile, three other Andreu brothers were born: René (1903-1976), Celito (Marcel, 1906-1970), and Rogelio (Roger, 1909-2001), who would soon become part of the family acts. After finally being accepted by a talent agency, the Andreus began to work regularly in French circuses. In 1910-12, they appeared in several minor variety theaters in Paris and on the stage of various Italian theaters. In 1913, during an engagement with the French Cirque Alphonse Rancy, they performed for the first time in their native Catalonia, at Barcelona's Tivoli, before opening their own Circo Reina Victoria in 1915. José performed his first clown entrée(French) Clown piece with a dramatic structure, generally in the form of a short story or scene. in the new family circus, under the name Boby, with his brother Polo. The Andreus' new circus venture lasted about ten years, alternating with foreign contracts. The family's main act remained their standing-frame flying-trapeze act, in which José started developing a comic character. Their second act was a large risley presentation (a widely popular specialty at the time), which included their father and another catcherIn an acrobatic or a flying act, the person whose role is to catch acrobats that have been propelled in the air.. In the late 1910s, circus and variety shows were invaded by parodies of Charlie Chaplin, whose extremely popular movie character, the Tramp, had become a customary comic addition to specialty acts in need of a comedy boost. José, who already used comedy in his trapeze act, introduced his Charlie character in 1916. To distinguish their trapeze act from the Andreus' risley act on the bills, the family titled it Charlie and the Rivels (Charlot et les Rivels). From then on, José Andreu would be known as Charlie Rivel. The legend later perpetrated by Charlie Rivel is that the brothers simply made up the name Rivel by picking letters at random. As a matter of fact, Rivel had been for a long time the stage name of Pedro Andreu, which he used for all the acrobatic troupes he created with his partners and children. Where the name actually came from remains a matter of speculation. On January 15, 1920, in Valencia, Spain, Charlie married Carmen Busto, a performer in his family's circus. She was the daughter of an equestrian clownGeneric term for all clowns and augustes. '''Specific:''' In Europe, the elegant, whiteface character who plays the role of the straight man to the Auguste in a clown team., Gregorio Busto. During a tour in Morocco, Charlie became Boby again, playing the augusteIn a classic European clown team, the comic, red-nosed character, as opposed to the elegant, whiteface Clown. to his brother René, the white-faced clownGeneric term for all clowns and augustes. '''Specific:''' In Europe, the elegant, whiteface character who plays the role of the straight man to the Auguste in a clown team., in the clown act René usually performed with their brother Polo. Since Charlie had a gift for comedy, they decided to form a clown trio, in the fashion of the successful Fratellini brothers, the shining stars of Paris's Cirque Medrano. Their father helped them develop an entrée(French) Clown piece with a dramatic structure, generally in the form of a short story or scene. that made good use of their exceptional acrobatic skills. It became the brothers' second act. The success of the Rivels' comedy-trapeze act, coupled with the Andreu clown trio, propelled them into big-time circuses and variety theaters: the London Coliseum in 1923 and, the following year, Cirque d'Hiver in Paris, where they were a sensation with the savvy Parisian circus audiences. Bertram Mills Circus at London's Olympia quickly followed. During his stay in London, Charlie is said to have won a competition of Chaplin impersonators at the Royal Albert Hall (which is plausible, since his Tramp character was eerily similar to the original). The event, true or false, started the oft-heard tale that he had outdone Chaplin himself during the competition—an unlikely occurrence, since Chaplin didn't visit Europe in those years. The Rivels were allegedly sued by United Artists for using the Chaplin movie persona without permission (perhaps simply for doing it too well and too successfully, for there were hundreds of Chaplin impersonators in the business). Charlie consequently performed his trapeze act as a generic drunk character. In any event, the Rivels continued to work in the most prestigious houses, including: Cirque Medrano in Paris (1925), the Scala in Berlin (1927), and Cirkus Schumann (1928). Soon their Andreu clown trio began to gain preeminence over their Rivels trapeze act. Although they were clearly inspired by the Fratellinis' trio structure, the Andreus had the advantage of their exceptional acrobatic talents, and they were soon recognized as one of the best clown trios of their time. René was the whiteface clownGeneric term for all clowns and augustes. '''Specific:''' In Europe, the elegant, whiteface character who plays the role of the straight man to the Auguste in a clown team. ; Polo was the first augusteIn a classic European clown team, the comic, red-nosed character, as opposed to the elegant, whiteface Clown., or contre-pitre; and Charlie was the second augusteIn a classic European clown team, the comic, red-nosed character, as opposed to the elegant, whiteface Clown.. They had two main entrées in their repertoire: an egg routine, and their famous acrobatic sketch, The Little Bridge, in which they tried to build (eventually succeeding) what is known in circus acrobatics as a bridge—a sort of moving human bridge. Their clown act could easily last up to thirty-five minutes; clowns, in the European circus, are often the stars of the show. 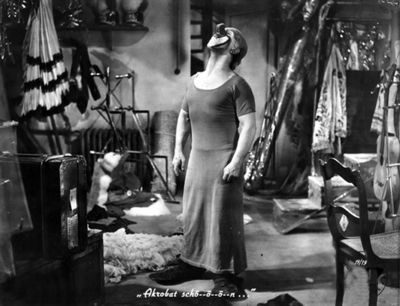 Charlie, like Albert Fratellini, quickly became the central figure of the trio, and like Albert Fratellini, he developed an eccentric character with exaggerated makeup and costume. Charlie's signature red hair, large square red nose, long red T-shirt, oversized black shoes, and childish behavior became familiar all over Northern Europe. 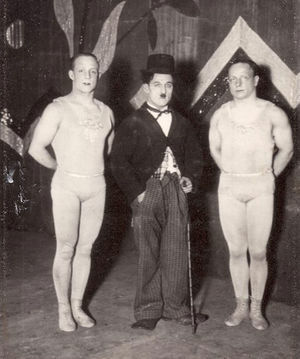 In 1930, the trio embarked on a one-year South American tour before returning to the vast German circus and variety circuit. But the working atmosphere between the siblings had deteriorated. Charlie, the most identifiable of the brothers, was the star, and he knew it. In 1935, at the Circus-Varieté Schumann of Frankfurt, Charlie decided to part ways with his father and brothers and to build a career with his sons and his wife. After Charlie Rivel's departure, his brothers continued to perform the same acts in German variety theaters, with no less success than they had enjoyed before. Celito replaced Charlie in the flying-trapeze act and the clown entrée(French) Clown piece with a dramatic structure, generally in the form of a short story or scene., and the younger Rogelio joined the act too in 1937. Then, in 1941, it was Polo's turn to leave the family acts. He worked for a time with the well-known French clown Alex Bugny, then with Andreff and Louis Comotti at Circus Knie in 1943, before teaming up again with Alex Bugny and finally embarking on a solo-clown career with the help of his sons. After World War II, René, Celito, and Rogelio continued to perform the traditional Andreu-Rivels acts in major European circuses, including: Hagenbeck, Williams, Scott, Strassburger, Pinder, Amar, and several engagements with Circus Knie in Switzerland. It was there, in 1952, that Celito, in front of an appreciative Charlie Chaplin, performed a Tramp parody on the trapeze, the act with which his brother Charlie had made a name for himself. 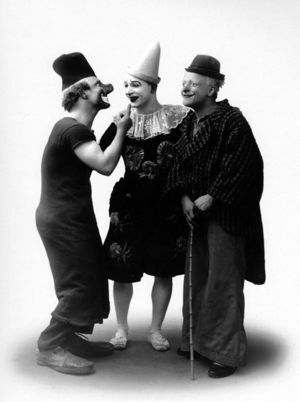 In the 1930s, two nearly identical Andreu-Rivels troupes were in business, each performing a clown entrée(French) Clown piece with a dramatic structure, generally in the form of a short story or scene. and a comedy-trapeze act: one was the original Andreu family troupe; the other was Charlie's. Like Grock, who was always billed as "Grock and Partner", Charlie's partners were always billed anonymously, ensuring that he, Charlie, was the star of the act. As this suggests, Charlie Rivel was not easy to work with. He changed partners often during these years. Among them were Paul and Alfredino, the Duo Reos, and the clowns Pauli and Johnny. Charlie and his wife, Carmen, had four children: Paulina, born in Barcelona in 1921; Juanito (Jorge-Juan, 1923-2004), born on a ship sailing between Valencia and Palma; Charlie, Jr. (1925-2011), born in London; and Valentino (1927-2006), born in Brussels. Charlie's children performed in a third family act, The Charlie Rivel's Babies. Now a wealthy star, Charlie bought a large house in Chenevières-sur-Marne, near Paris. Yet he worked mostly on the German variety circuit, which proved lucrative. He also appeared in Scandinavia, with Bertram Mills' Circus at London's Olympia, and in South America during a 1936 tour. After the Nazis seized power in Germany, and even during World War II itself, Charlie remained one of the biggest draws in the top German variety theaters: Wintergarten, Apollo, Scala, and Plaza. In Berlin, he starred in a movie directed by Wolfgang Staudte, Akrobat Schö-ö-ön (which was Charlie's catch phrase in the Little Bridge entrée(French) Clown piece with a dramatic structure, generally in the form of a short story or scene.). The film was released in 1943, and it revealed Charlie as a genuine screen talent. In later years, a telegram that Charlie had sent to Hitler for his birthday in 1942 would became the subject of wild speculations. Like many traveling performers little acquainted with international politics, Charlie had been dangerously naïve. Following the Allied victory, Charlie had to sneak out of Germany. He found refuge in Scandinavia before returning to his house near Paris. Shunned by agents and directors in the postwar years, he fell into a prolonged period of depression. "Who can laugh now," he wrote, "after so much tragedy?" He would not return to the ring until 1952. In the 1950s, the idea of a celebrity clown was beginning to look like a thing of the past. Grock himself decided to retire—though not before launching a long series of farewell tours. In time, Charlie became the one true international clown star of the postwar era. Back in the ring in 1952, Charlie performed principally in Germany and Scandinavia, where he enjoyed a renewed success. His old acrobatic clown entrée(French) Clown piece with a dramatic structure, generally in the form of a short story or scene. was revived with two new partners: Armand Miehe, as his contre-pitre, and Bernhard Brasso as his whiteface clownGeneric term for all clowns and augustes. '''Specific:''' In Europe, the elegant, whiteface character who plays the role of the straight man to the Auguste in a clown team.. 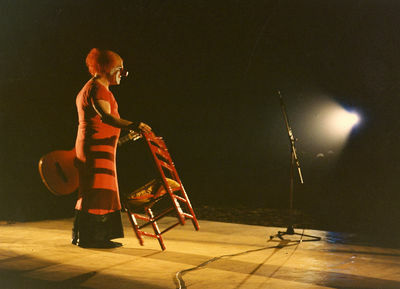 The new version started with a musical routine involving a chair and a guitar, followed by the Little Bridge acrobatic routine, and ending with a parody of an opera diva. (The routine would be eventually known as Maria Callas.) They also revived the flying-trapeze act, with Charlie as a drunk in tuxedo and top hat. Meanwhile, in 1947, Charlie's sons had sailed to the United States, where they performed a remarkable acrobatic act as The Charlivels, which quickly became one of the greatest nightclub acts of the era. Daughter Paulina married Albert Schumann, of the illustrious Cirkus Schumann, and embarked on an outstanding equestrian career. Charlie had worked mostly in Northern Europe when Spanish impresario Juan Carcellé decided to bring him to his native country, where he was virtually unknown. In 1954, having used the press to drum up a fan following for the northern clownGeneric term for all clowns and augustes. '''Specific:''' In Europe, the elegant, whiteface character who plays the role of the straight man to the Auguste in a clown team., Carcellé made Charlie the star of one of his Circo Price Spanish tours. This led the Spanish national television to produce a program about Charlie in 1962. The following year, his birthplace of Cubelles named a street after him. Thus began a long period of honors and awards in Spain, Germany, and Scandinavia, where Charlie was becoming a living legend. Film director Manuel Esteba had him star in a Spanish movie about himself, El aprendiz de clownGeneric term for all clowns and augustes. '''Specific:''' In Europe, the elegant, whiteface character who plays the role of the straight man to the Auguste in a clown team. 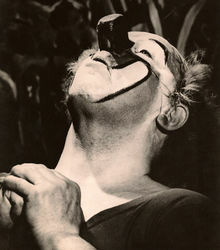 (The Clown Apprentice, 1968). Charlie gradually shifted from the clownGeneric term for all clowns and augustes. '''Specific:''' In Europe, the elegant, whiteface character who plays the role of the straight man to the Auguste in a clown team.-trio format to solo work. Abandoning forever his flying-trapeze act, he began developing two pieces that would become clowning classics: his musical entrée(French) Clown piece with a dramatic structure, generally in the form of a short story or scene. with chair and guitar, and his parody of an opera diva. He was assisted in the ring by his son Juanito and later, after Cirkus Schumann had ceased to exist, by his daughter, Paulina. The two sketches remain masterpieces of clowning, among the few that are impossible to replicate. In 1960, they were the center pieces of Cirque Medrano's Christmas program, in a very successful production titled Rêve de Clown ("A Clown's Dream"), which marked Charlie's triumphal return in front of a Parisian audience. Charlie Rivel published his autobiography in Denmark in 1971, titled Stakkels Klovn (Poor Clown). The manuscript was immediately translated into several languages. In 1972, he appeared as himself in a sequence for Federico Fellini's film I Clowns. In December 1974, he was the very first recipient of the Gold Clown award at the 1st International Circus Festival of Monte Carlo. He was seventy-eight years old. By then, he was approaching the end of his career. He continued to work in carefully selected events or for limited engagements in prestigious circus buildings, such as Munich's Kronebau, Madrid's Circo Price, or Copenhagen's old Cirkus Schumann, which had become Cirkus Benneweis. He also appeared on television in Sweden and Spain, either as guest, host, or as the subject of movie shorts and documentaries. In 1979, Charlie's son Juanito started his own clown career at Circus Knie, where he revived the Andreu-Rivels' legendary Little Bridge entrée(French) Clown piece with a dramatic structure, generally in the form of a short story or scene. with Gaston Hani and Rolf Knie, Jr. Charlie's wife, Carmen, passed away in 1972. Ten years later, he married Margarita Camas in Barcelona; he was eighty-six. That same year, in 1982, he agreed to travel to Madrid to perform with the famous Circo de Los Muchachos, a remarkable children's circus, whose performers were young orphans. It would be his last performance. In 1981, Charlie Rivel received the cross of the Nordstjärneorden (Order of The Polar Star), the highest civic distinction in Sweden, which was presented to him by the Swedish Minister of Labor. But Charlie's later years were plagued with respiratory ailments, and on July 26, 1983, he passed away at the hospital of Sant Pere de Ribes in Catalonia, Spain. The following morning, photographs of the great clown were prominently displayed, surrounded by flowers, in the shop windows of Stockholm. Statues of Charlie Rivel stand in Munich (near Circus Kronebau), Barcelona, and Cubelles.